4. From the Servers Table select the ID # of the desired server. This will load a new page on the right (shown below), displaying the selected table's information. 7. Edit the PIN of the server. The PIN is used to log into the Groovv Register app and allows for tracking of transactions, tips sales in reports. 8. Select or click to clear the checkbox(es) of the Allowed Functions of the Server. Definitions of the Allowed Functions can be seen by hovering the mouse over the [?] in the back office and the image below. Note: Credit card transactions run in training mode can not be recovered as they do not reach out for approval. The approval shown is meant for training purposes only. Clerks/servers can not be deleted. However, they can be renamed and retooled to serve a new purpose for your store or restaurant. 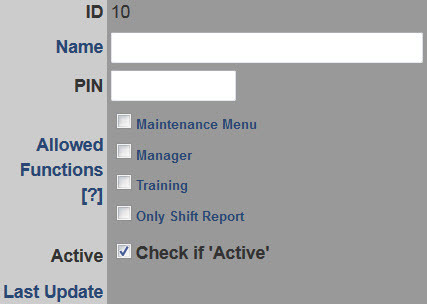 They can also be marked inactive as mentioned above to track all previous employees or to save time recreating an employee who is going to be away from the business for an extended period of time.